Gerhard Richter, Catalogue Raisonné, 1962-1993, Ostfildern-Ruit, 1993, Vol. III, p. 181, no. 625 (illustrated in color). Cologne, Galerie Rudolf Zwirner, Gerhard Richter 20 Bilder, October-November 1987 (illustrated on the cover of the invitation). Amongst the various abstract painters and neo-Expressionists who occupied the 1980s, Gerhard Richter's contributions stand out as ambiguous exceptions to most of the rules. The lively colors he uses, often unmixed with others, lend his works a brazenness and brashness, giving the viewer a sense of passion and fire, especially in the reds and yellows. And yet these paints have not been applied in some ferocious artist's attack of the canvas. These are not 'Action' paintings. Instead, Richter slowly and paintstakingly builds layer upon layer of color and form, creating a strange and impenetrable quilt of color. "What shall I paint? How shall I paint? 'What' is the hardest thing, because it is the essence. 'How' is easy by comparison. To start off with the 'How' is frivolous, but legitimate. Apply the 'How', and thus use the requirements of technique, the material and physical possibilities, in order to realize the intention. The intention: to invent nothing-- no idea, no composition, no form-- and to receive everything: composition, object, form, idea, picture' (G. Richter quoted in Gerhard Richter: The Daily Practice of Painting. Writings and Interviews 1962-1993, ed. H.-U. Obrist, ed., trans. D. Britt, London, 1995, p. 129). The scientific sensibility with which Richter has assembled a painting with 'no idea, no composition, no form' is mirrored by the artist's scientific interest in evoking feelings in the viewer. 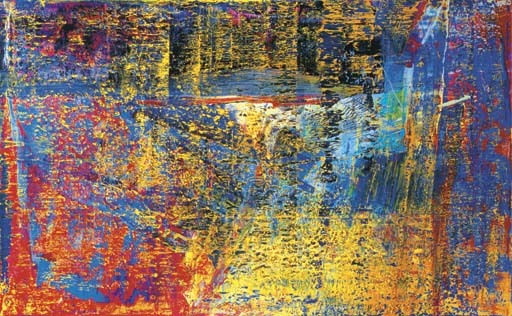 In the same way that Abstraktes Bild shows a catalogue of colors and techniques- for instance the smeared yellows contrasting with the dark background and the lurid blues- Richter manipulates the viewer's emotional response. In the construction of the painting, Richter meticulously worked to keep Abstraktes Bild devoid of meaning, yet he has a painter's sensitivity to the amount of emotion that colors can arouse in the viewer. With this in mind, the yellows and reds have been juxtaposed not with frenetic energy, but with an artful analysis of what emotional response each juxtaposition would provoke. In all this, Richter as artist remains aloof, working on several canvases, avoiding any emotional intensity of his own in the execution. This level of control echoes the manipulative nature of the Photo Paintings, where Richter choses an arbitrary subject matter that often means nothing to the viewer, or his landscapes where he deliberately creates Romantic images out of mediocre photographic sources. In the same deliberate way that he selected sources for these works, here he has created something in which he has artificially controlled the amounts of color, the harmonious juxtapositions, to create a painting that magically inspires the viewer. Richter has disassembled the gift of communication so central to so much art. He is not allowing the viewer a glimpse of his own soul or his own heightened appreciation of life. Instead, he has deconstructed the entire process, ridiculing the idea of the painter as an alchemist or a shaman and in its place expressly revealing the extent to which he is a mere conjuror instead. In his Abstract Pictures, Richter performs the equivalent of revealing the puppeteer's invisible strings. It was the aesthetic quality of these Abstract Paintings rather than their conceptual content that led to Richter's initial success in the United States. Until then, despite his fame and success in Europe, the American market had shown little recognition of his works. Although the thinking behind these paintings was almost diametrically opposed to artists such as Julian Schnabel, Jean-Michel Basquiat or David Salle, it was in part the loudness they shared that initially attracted the Americans to them. Richter himself has commented that there was "A demand for paintings that I satisfied, and at the same time there was this conceptual notion against painting-- and so I served both sides. That was rather smart, a legitimation to enjoy them. 'Yes, pleasure without remorse. Because with this intellectual, conceptual background, you would always have an excuse. They are colorful and painterly but they are also very intellectual. Be careful!" (G. Richter quoted in R. Storr, "Interview with Gerhard Richter", pp.287-309, exh.cat, Gerhard Richter: Forty Years of Painting, R. Storr, ed., New York, 2002, p. 287).